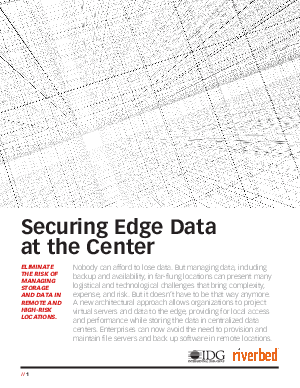 Data on the edge of the network may be subject to a variety of risks. Data centers are built to secure systems and data, and to help ensure business continuity and recovery after interruptions and disasters. Remote offices, on the other hand, generally lack the defenses typically employed by data centers to keep out the unwanted and harmful. It’s now possible to extend the virtual edge of the data center to the branch office, enabling complete consolidation of edge servers and data, improving data security, and providing users with LAN performance at the edge of the network via the WAN.